Walter Coker’s serpentine life in surfing and journalism. A profile from the new issue of TSJ. On a thin strip of land between the Summer Haven River and the Atlantic Ocean in northern Florida, mangroves and oyster beds rose and fell along the river, stretching back to hammocks of oaks and sabal palms. The locale demonstrated the value of a view. With the ocean just a stone’s throw away, Walter Coker, 61, a life-long surfer and veteran photojournalist, stood on that thin spit as the hum of an approaching skiff’s engine grew louder. Our heads followed the boat as it passed us and moved toward the remains of an abandoned home, long ago swallowed by the Atlantic. A mangled dock, strewn with sand, was the only structure left to mark the property. Coker, who lives just up the road in Crescent Beach, has spent the past 30 years up and down this coast and has watched this thumb of sand slip away, bit by bit. When a “restoration project” began at Summer Haven in 2016, he was skeptical. Anyone who has grown up along the Florida coast knows re-nourishment essentially just moves sand from here to there and back again. In most cases, the U.S. Army Corps of Engineers heads these projects, but in Summer Haven, a private engineering firm called Turnbull Environmental Inc. won the contract from St. John’s County. Once Coker knew who to call, he did so incessantly, as any cogent reporter would. After countless hours of dial tones, voicemails, and roundabout directories, “Nobody could answer me,” he said of the endeavor’s goals. “It’s not a feasible project,” he added. “They keep piling up sand, thinking it’s going to stay. It’s not going to.” He cackled with a Southern dose of realism. Clad in a t-shirt, baseball cap, jeans, and sandals, he seemed to reflect a down-home spirit, but his blue eyes were more serious. It’s essential to understand the gravity of the predicament. Over time, like all of Florida, development ate up plots of land along this coast. In 2008, the Summer Haven River carved a serpentine path through the island south of the inlet, then started to fill with sand as the ocean breached the thin ribbon of terra firma separating one body of water from another. Coker and I were essentially standing upon a monstrous ant pile of silt, fill-dirt, and riverbed laced with root and sediment, a manmade berm intended to protect the homes there. It looked apocalyptic. This gargantuan mound stretched for more than a quarter of a mile between two houses. On the northern edge, a jetty of granite boulders was showered in salt spray and, to the south, about a dozen homes with water rushing beneath them stood as a chilling testament to the reality of rising sea levels. Only about 200 feet wide, the spit shifts each day due to wind and swell. And just to the north, within eyesight, Matanzas Inlet flows in and out of the Atlantic, further complicating the county’s attempt to bolster the shoreline. Turnbull Environmental promised to “restore” the river, but the project exacerbated erosion. Coupled with unfettered development, the situation has left many homeowners with literally no road to access their homes. This is compounded by a decree from Florida Governor Rick Scott, who issued a gag order on state employees from uttering the words “climate change” or “global warming.” By proxy, there seems to be a moratorium on addressing sea-level rise, leaving communities like this one to go it alone. Coker and I were essentially standing upon a monstrous ant pile of silt, fill-dirt, and riverbed laced with root and sediment, a manmade berm intended to protect the homes there. It looked apocalyptic. On the northern edge, a jetty of granite boulders was showered in salt spray and, to the south, about a dozen homes with water rushing beneath them stood as a chilling testament to the reality of rising sea levels. While wandering around this newfound no-man’s land one day, Coker came across a homeowner rebuilding the steps to his house on stilts. The man told him he planned to construct a bulkhead around his home to protect it. At best, the result would be a small outcrop of sand, with his home hiding behind a scrim of corrugated plastic and steel. When pressed about the solution, the man admitted that someday he’d be visiting this place by boat. Two months after my first visit to the spit, a nor’easter carried the Atlantic into the Summer Haven River again, washing away the county’s efforts in mere hours. After a lifetime stalking these fickle sandbars as a surfer, and reporting in the region for the past 30 years, Coker was aptly positioned to see the folly of restoration. To document the process, he’s been making photographs of the disappearing coastline. As I spent time with him, I came to learn that more than just the beachfront was disappearing. For Christmas, 1977, while he was still a student at the University of Florida, Coker’s parents gave him some money to take a surf trip. Eleuthera in the Bahamas was making its ascension as a destination for East Coast Surfers, but the waves were “so-so” in Coker’s estimation. In the university’s map collection, he pored over bathymetrical charts. His calculus was that if there were waves in Puerto Rico and Eleuthra, there must be waves between the two. He had his eyes on a little limestone outcrop rearing from the ocean floor, barely large enough to be considered an island. This particular Bahamian blip stuck so far out into the Atlantic that he assumed waves must lap all its edges. It was one of his first forays into the lesser-traveled corners of the world, an instinct that would reassert itself throughout his life. After a harrowing journey in the midst of a cold front, he set foot on the small island’s dock. A bit of hitch-hiking revealed empty, “non-stop, perfect surf.” When we spoke, he described the place as though it were an ex-girlfriend he still cared for. It felt wrong for other surfers to step foot on its shores, he said. “I have weird feelings about it,” he quipped. Even today, there are stretches of coastline on this speck of land that Coker isn’t sure anyone has explored. On his most recent trip in January, which marked 40 years since his first, he found nooks he hadn’t yet surfed himself, which begged the question: had anyone? “There’re still secrets out there,” he confided. Even today, there are stretches of coastline on the island that Coker isn’t sure anyone has explored. On his most recent trip in January, which marked 40 years since his first, he found nooks he hadn’t yet surfed himself, which begged the question: had anyone? “There’re still secrets out there,” he confided. When Coker moved to St. Augustine in 1990 with his wife, “it was a closed town.” He’d planned to build a freelance photo outfit, but the entrenched good-ole-boy network that hung over the community made it hard for him to generate the necessary connections. “I was floundering,” he said. Before the move, Coker worked as the staff photographer for his alma mater, the University of Florida, which lent him a varied oeuvre while shooting everything from archaeological digs to athletics. Much of his work ended up on the Associated Press’ national wire. He’d also been the photo editor for a sports paper started by a fellow alum, called Gator Bait. With little work to do in St. Augustine, he applied for a job at Folio Weekly, a paper in Jacksonville. Fortunately, they took him on. For the next 21 years, Coker would drive for half-an-hour up the sleepy artery of pavement between St. Augustine and Jacksonville to the Folio offices. When he took the job in 1992, two traffic lights punctuated the drive. By the time he left in 2013, dozens of lights, and the slow creep of cul-de-sac enclaves, had dramatically altered the experience. At work, his salary steadily rose until the economy crashed in 2008. As a free paper, “all our salaries were paid by advertisers,” he explained. “They pared me down toward the end.” Fiscal concerns aside, Coker became intimately familiar with the region and its history. The ancestral presence that pervaded much of the area became clear to him through his assignments. If prompted, he can tell stories of the place with a steadfastness akin to an encyclopedia. Out in Hastings, an agricultural outpost that was established by Henry Flagler to support his hotels in nearby St. Augustine, Coker worked on a story that forever changed his photography. Folio had just hired a journalist named Anne Schindler after a glowing recommendation from David Carr, the lauded New York Times cultural critic. Her first reported story was about migrant workers in Hastings, a community living under conditions that resembled indentured servitude—entrapped by hidden housing costs and fees prescribed by their managers. Through one of Schindler’s contacts, Coker tagged along one day with a woman who was distributing goods to the workers. “I was out of my comfort zone by a long shot,” he said. He had been a photojournalist for only a year, but his editors let him take a month off to wander Indonesia. He remains surprised by that fact, but also acknowledges it’s fitting that the same peripatetic curiosity that got him the job would lead him away from it. When I asked him about his relationship between surfing and journalism, he acknowledged that curiosity lent itself to both pursuits. “I didn’t know anything about his history, but his face told a story of a very hard life,” Coker remembered. He was still visibly moved when recounting the story. All Coker got was his name: Chicago. And although Chicago didn’t make Schindler’s piece, Folio did run a full-page photograph of him, the first time they’d given that much real estate to a single image. Evidently it was a turning point for Coker, too. Suspended in the Lombok Strait aboard a boat named Lady Luck, Coker looked out to sea and became petrified. The eddies, boils, and open-ocean swells towering over the gunwales looked like a standing wave that would surely subsume the vessel. “It was completely touch and go,” he remembered. Somehow, not without trauma, Coker and crew made it across the trench and started weaving in and out of the striated islands. At the time, in 1993, “there were no other boats,” Coker said. Rounding Lombok, they stopped by Desert Point. Pablo Miller and a few feral die-hards were camped out on the beach already. Even though the waves were small, Coker could see the promise. He remembered watching waist-high walls reeling along the corner and thinking, Damn! He had been with Folio for only a year, but they let him take a month off to wander Indonesia. He remains surprised by that fact, but also acknowledges it’s fitting that the same peripatetic curiosity that got him the job would lead him away from it. Today, Coker maintains a furniture shop in St. Augustine, writes occasionally, and photographs tenaciously. He calls himself an accidental businessman, because his shop grew out of that trip to Indonesia in 1993. “It’s working out alright,” he said in his modest way. That failsafe has especially applied to the surfers within Coker’s ten-mile radius in Crescent Beach—a coastline where countless stretches of sand still remain undisturbed. It also led Coker around the world, through a career in journalism, and to this very spot where we were talking. He had witnessed many places and things slip away before his eyes—sealed underneath a cul-de-sac or lost to the Atlantic—and his urgency to protect them was acutely felt. His work, like the images he’d been making of the spit along the Summer Haven River, stood sentry to the sentiment. He’d been plumbing the depths of his sense of place for a lifetime. The late afternoon sun had broken through a dreary marine layer and lit up the remaining cumulus clouds in shades of pink and orange arcs. At that moment, Coker’s little slice of Florida felt like a peninsula positioned at the backend of time, somewhere that the world had almost forgotten. Watching him in his habitat made me want to go on a trip of my own, to find a place I’d return to for the next 40 years. While sitting out behind his house on the river, we watched as the water took on a cerulean hue in the late-afternoon light and the sawgrass lit up in a lucent rage of green and yellow, the sun slipping away behind the pine trees across the Matanzas River. Why exactly Coker ended up on this patch of land between the Intracoastal Waterway and the Atlantic is complicated. In part, he was following an opportunity to restore Genung’s Fish Camp, a bait shop that had existed here since 1948, but which had fallen into disrepair. More clearly, his marriage had also unraveled. In the midst of that period, an admittedly dark one, he nestled into Genung’s—slowly restoring the grounds alongside his own life. When I visited him in January for a bonfire, we talked—some stories bright, some morbid. I asked if he’d spoken with his daughter, who had declined to stay in touch following the divorce. He told me their relationship was limited to e-mail and cursory. “That’s the latest there,” he said. Driving south, down U.S. 1 from St. Augustine to Crescent Beach, toward what they call “the Palm Coast,” I passed a barrage of strip malls and wide intersections endemic of Florida. Then, after crossing over Moultrie Creek, I fell into “old” Florida. Stands of longleaf pine flanked the road en route to an area called Du Pont Center—nothing more than a wide spot in the road that harkens back to the area’s Minorcan roots. Hooking east onto State Road 206 toward Crescent Beach, I passed bundles of palmetto, two-tracks reaching into the woods, and signs that advertised: SALE PENDING. Finally, crossing over the nexus of islets and oyster bars just north of what’s known as Devil’s Elbow, I saw smoke billowing up from Coker’s place. I could even see him stoking the flame from the bridge. The late afternoon sun had broken through a dreary marine layer and lit up the remaining cumulus clouds in shades of pink and orange arcs. At that moment, Coker’s little slice of Florida felt like a peninsula positioned at the backend of time, somewhere that the world had almost forgotten. Watching him in his habitat made me want to go on a trip of my own, to find a place I’d return to for the next 40 years. The impulse spoke to something we all do as surfers, which is ultimately about cultivating curiosity—a subterranean thread of solidarity among us all. Coker had shaped that interest into a life and career where personal, public, and environmental interests were inextricably bound to each other. 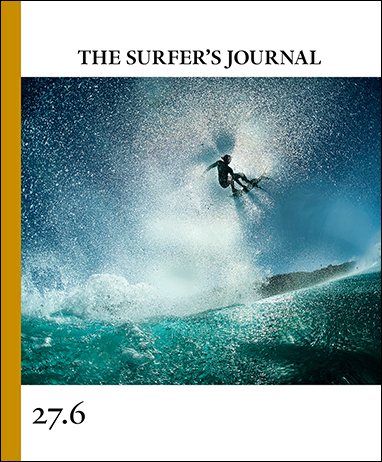 Read more features from TSJ 27.6 now.